How’d you end up with him? He’s managed to survive three months of me, swearing, procrastinating, sulking and even crying (although the crying part was totally his fault). But first of all you need some background info. 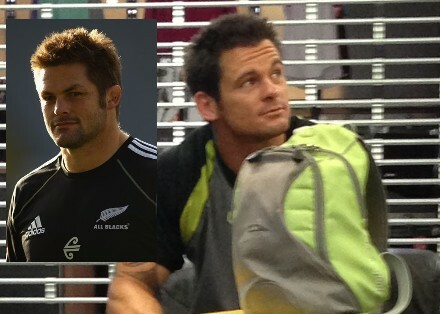 The most important fact being that my friend Clare has a wee thing for Richie McCaw – actually no, she has a huge thing. You know how “all the girls” went gaga for SBW during the World Cup (especially during the “shirt” incident)? Piri actually grabbed Richie after his training had finished for Yumes and I and he took the photo, he thought it was hilarious that I thought “the cap” was scary (which he is) ..
Anyhoo back to the original story of Mr P.T. At the beginning of the year I joined Les Mills and started doing spin classes. One morning as I went to leave I looked up and nearly fell over my feet when I spied Mr P.T sitting in the lobby doing some work. All week he seemed to be in the same spot as I left the gym so I had to tell Clare ..
At that stage that was about as far as it went. We knew who “Richie” was and if he was on the floor the scenery was nicer. Yep that’s an actual pap photo! However he may have caught my eye because he’s nice to look at but he’s kept me because the boy is an AMAZING trainer so even though I was being totally shallow when I selected him I scored big time! Sure he does the eyebrow thing, he’s scolded me, he’s teased me, he’s thrown his hands up in the air in frustration, he’s stood hands on hips with the Mr Stern face and he’s even made me cry but he’s also knowledgeable, supportive, patient and a bully when he needs to be. He also cue’s better than any trainer I have ever worked with which really helps me when I’m learning new skills. Sometimes even when you don’t deserve it things turn out great!